I must admit that animals often catch my eye by themselves, but this immersive group of builds by Sven Franic is even better. 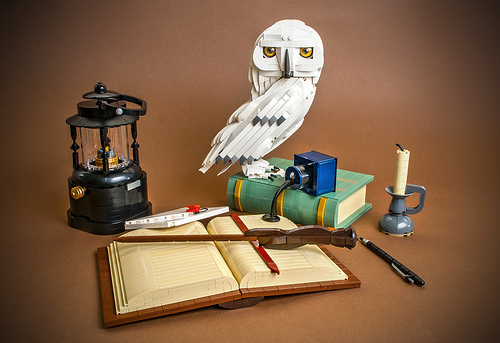 It’s easily recognizable as Hedwig and a collection of Harry Potter’s possessions. But what impresses me the most is the exceptional attention to detail and unique use of parts. Take the ink-spill or the black hotdog wick on the candlestick, for example. The conical hat from LEGO Ninjago sets was an excellent way to finish off the handle of the wand. Additionally, the 6-stud shooter and gold wheel were a great solution for the lamp filament. I admire the body-shaping for Hedwig, as it’s not an easy feat to produce nice feathers on a bird looking straight on, let alone from the side. Sven is not a stranger to building birds. Back in June he produced a pretty epic toucan. You could even build your very own cuckoo clock bird using Sven’s excellent instructions! 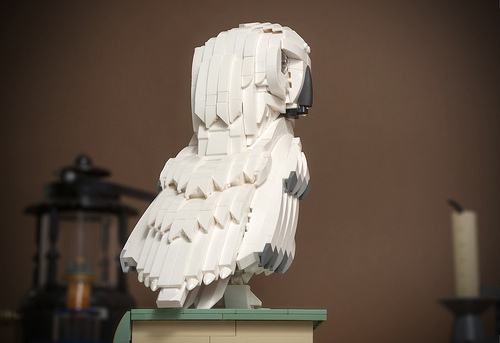 This lovely model of Harry Potter’s famous owl, Hedwig, is the work of DOGOD Brick Design. 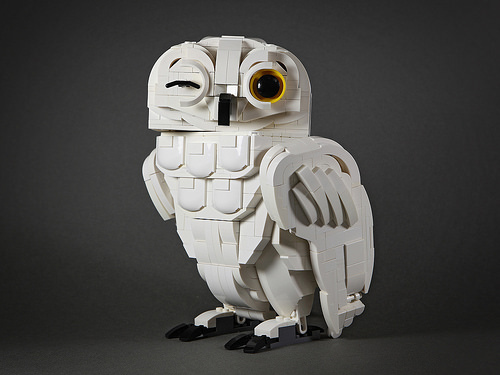 He does an exceptional job producing streamlined, organic shapes with LEGO. One of my favorite aspects of this model is the use of the automobile hoods to resemble chest feathers. I also love that she is posable, and that the handlebar used for the wink is easily replaced with a matching eye. If you like this, check out his adorable Niffler! We also recently covered his excellent Frankenstein for Halloween. 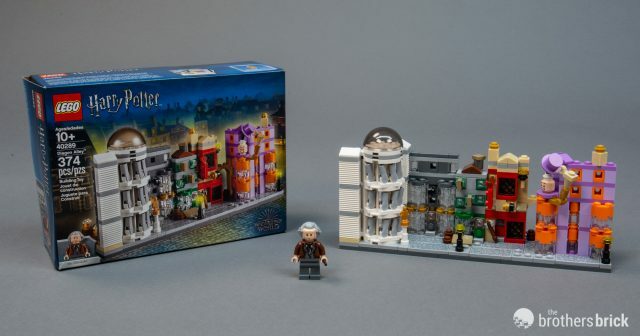 To celebrate the release of the new Fantastic Beasts movie this month, LEGO is releasing 40289 Diagon Alley as a giveaway on LEGO Shop purchases over $99. LEGO sent us an early copy of the set to review. 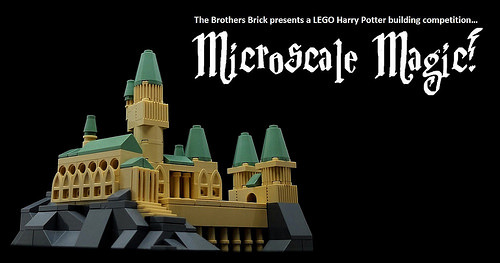 The microscale set is built to the same scale as 71043 Hogwarts Castle, and includes 374 pieces along with a minifigure of wand shop owner Mr. Ollivander. 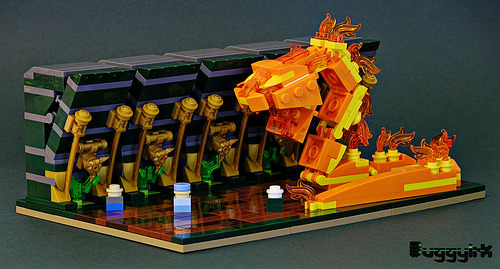 Robert Maier has opened the LEGO Chamber of Secrets and unleashed a fantastic beast of a basilisk! If you’ve followed Robert for a while like we have you’ll note this model, while a bit of a departure from his usual post-apocalyptic fare like a toxic wasteland and a world without trains, displays his typical knack for textured, murky worlds. In this scene you can see Tom Marvolo Riddle (AKA teen Voldemort) near the climax of the book/movie after he has spent months manipulating Ginny Weasley with his diary-Horcrux. Here she’s unconscious just before Harry Potter swoops in to save the day on Fawkes the phoenix in a bit of deus ex machina. The ambiance of the scene is perfect with bones of victims past, rotting plant life, and foggy water. 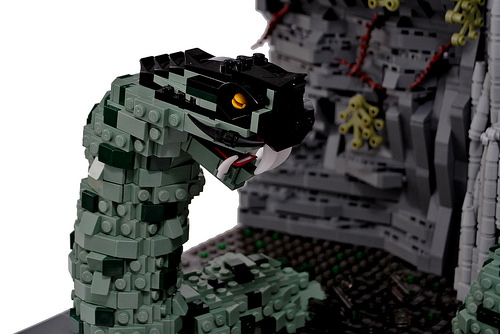 The basilisk model itself dominates the chamber as it slithers out of Salazar Slytherin’s statue. I especially like the vertical nature of the statue against the horizontal striations of the chamber walls. You can check out some finer details of the basilisk itself in the closeup shot below. It’s a far cry from the basilisk we reviewed in the Hogwarts Great Hall! I would say that Harry Potter & The Order Of The Phoenix is my favorite Harry Potter movie, but then again, it’s likely that on another week I could say the same about the other seven. 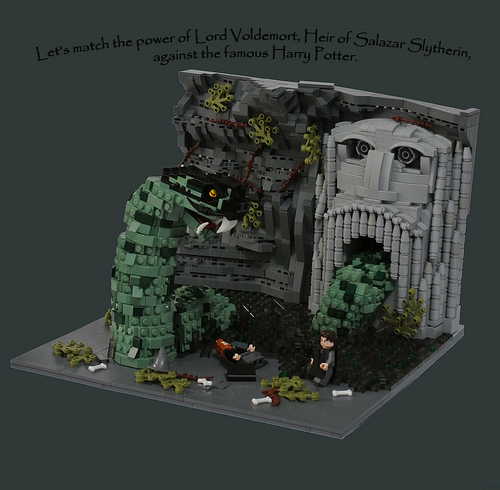 However, two things are for certain: The duel between Dumbledore and Voldemort at the Ministry of Magic is one of the most epic wizard battles in the series, and Buggyirk has done an excellent job creating a microscale version of this intense battle in LEGO. I love the use of trans-bright green Nexo-Knights helmet accessories as the green fire used for transportation via the floo-network. Voldemort’s giant fiery dragon, which he hurls at Dumbledore (likely the most difficult part of the scene) is instantly recognizable and well done using a combination of simple solid orange, yellow, and trans-orange parts. 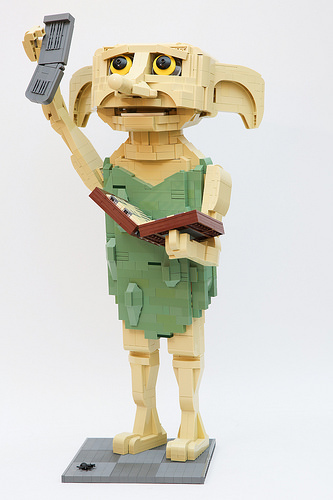 This LEGO model was built as an entry for TBB’s Microscale Magic contest. Coverage on TBB of an entry will not be taken into consideration during judging, and will have no effect on its ability to win, either positively or negatively. I’m always thrilled by tiny vignettes that squeeze in details that tell the story well. 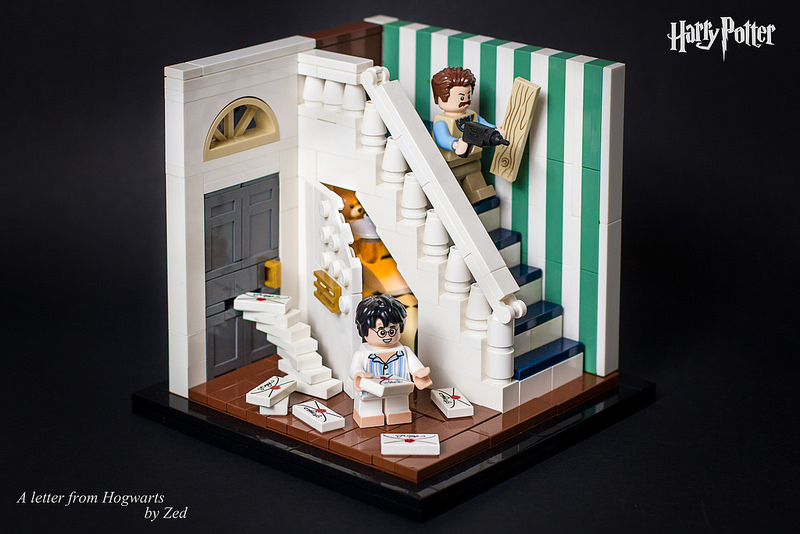 This vignette by Zed highlights the memorable scene in Harry Potter and the Philosopher’s Stone when the Hogwarts invitation letter is delivered to Harry in the Cupboard Under the Stairs. Though not fully movie accurate — as I do recall the door of the Dursley’s home was at the bottom of the staircase — it makes more sense for this little vignette to have it on the opposite end. I still can’t figure out how LEGO elements were arranged to construct that sturdy-looking entrance door, but it certainly looks good. 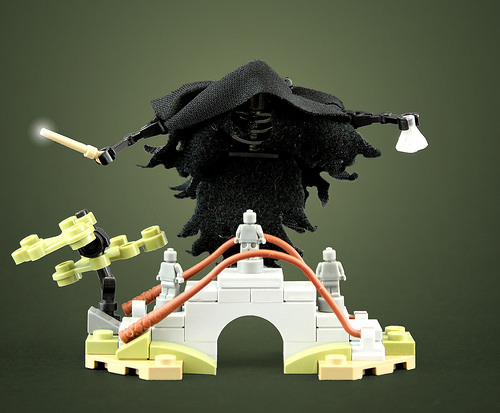 Prolific model builder Aaron Newman is back with another foray into the (LEGO) Wizarding World. This microscale scene is itself an homage to builder Aaron’s own minifigure scale Tale of the Three Brothers from back in April of this year. The pieces Aaron’s chosen to replicate his own work in a smaller scale are spot-on: bullwhips replacing flex tubing, statuettes replacing minifigures, and perhaps the funniest and most appropriate detail is the microscale Elderwand represented by a minifig-scale wand now grasped by the formerly-larger-than-life figure of Death. I suppose the only question I’m left with is whether Aaron will attempt this scene in yet another scale in the future? One of the sweetest moments in the Harry Potter series is when the young wizard gives Dobby a sock at the end of Chamber of Secrets. It is at that moment that the loveable House Elf becomes free from the Malfoys. This tribute to that moment, built by Chung-Heng Cheng, is an exceptional work of art. The body shaping is really nice and it’s immediately recognizable as the little hero. Can’t get enough of all things Wizarding World? Check out our Minifigure Feel Guide (which includes Dobby) as well as our review of the new 71043 Hogwarts Castle (which includes scenes from the Chamber of Secrets). Early this morning, Leicester Square witnessed the biggest gathering of Harry Potter fans since the final film premier was held there in 2011. Fans of LEGO and J. K. Rowling’s famous wizard were out in force, excitedly queuing outside the store, some camping out overnight for the highly anticipated 71043 Hogwarts Castle set, which is now available. At over 6,000 pieces, 71043 Hogwarts Castle is the second-largest LEGO set released by the company to date. Packed full of amazing architectural detail and showcasing almost every important scene from the series, it certainly lives up to its billing. Earlier today we posted a full review of the Hogwarts Castle LEGO set that covers every nook and cranny of the impressive build. At 6,020 pieces, the new microscale 71043 Hogwarts Castle is the LEGO set with the second-highest part count ever, exceeded only by last year’s 75192 UCS Millennium Falcon at 7,541 pieces. 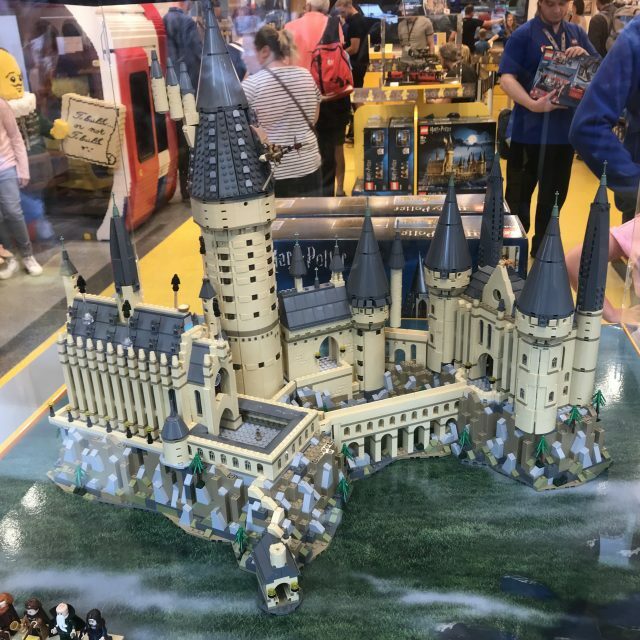 This massive Hogwarts is part of the new wave of LEGO Harry Potter and Fantastic Beasts sets, including the minifig-scale 75954 Hogwarts Great Hall. 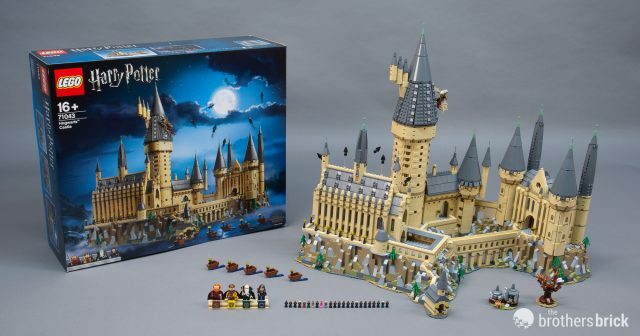 In what is sure also to be one of our longest LEGO set reviews ever, we’re immersing ourselves in J.K. Rowling’s Wizarding World as we take a close look at this massive set, which retails for $399.99 and will be available on September 1st (August 15 for LEGO VIP Program members).